P S NO 76 (1966) The 337 ton 120 foot steel barge P S No 76 was destroyed by a storm August 27, 1966 at East Landing, Saint Paul Island. P T & B CO 1652 (1948) The 1,008 ton 202 foot wooden barge P T & B Co 1652 foundered October 17, 1948 about 20 miles north of Seguam Island in the Aleutian Chain. PACIFIC (2001) The 40 foot longline cod fishing vessel Pacific stranded and was lost October 11, 2001 in Iliuliuk Bay near Priest Rock. The operator had fallen asleep at the wheel. All three crewmen abandoned ship to the beach. Salvage was being considered. PACIFIC ROSE (1982) The fishing vessel Pacific Rose capsized and sank August 2, 1982 approximately 65 miles northwest of Saint Paul Island. PACIFIC STAR (1987) The 40 foot fishing vessel Pacific Star was struck by a rogue wave and sank February 4, 1987 approximately 60 miles south of Agattu in the Aleutian Islands. One crewmember was lost and five were rescued. PAN NOVA (1983) The Korean freighter Pan Nova collided with another freighter September 10, 1983 northeast of Dutch Harbor near Unimak pass and began taking on water. She eventually sank north of Akun Island. The Pandora, valued at $500 was a total loss. She was in ballast and carrying no cargo. The crew survived. There was no insurance. The master of the vessel, Nicholas Wagner went to Unalaska for assistance which was rendered by the Revenue Cutters Tacoma and Unalga. The Paramita was a total loss. Her cargo was partially salvaged. The vessel had no insurance but the cargo was insured for $30,000. PAVLIN VINOGRADOV (1944) The 2,864 ton Russian ship Pavlin Vinogradov was sunk by Japanese submarine I-180 April 23, 1944 approximately 250 miles southeast of Dutch Harbor. The vessel was carrying a cargo of acetone from Portland to Vladivostok via Akutan when she exploded and sank in less than a minute. 13 crewmembers perished in the initial explosion and 29 escaped in a life boat. Of those who made it into the life boat, only 9 survived the 6 day ordeal before rescue by the Russian steamship Ola. PAVLOV (1990) The 163 foot fishing vessel Pavlov burned in the Pribilof Islands February 4, 1990. All 19 crewmembers abandoned ship to life rafts and were rescued by the fishing vessel Shishaldin. Comment: This vessel may have been salvaged and returned to service. It was verified that W T Peterson was the Chief Officer of the missing steamer Pelican. Many searches were conducted but no sign of the Pelican, or her crew, were ever found. The steamer was captained by Alexander Gove. PERRY (1910) The 451 ton 161 foot steamer Perry, in service as a U S Revenue Cutter was lost July 30, 1910 at Tonki Point Reef on Saint Paul Island. The vessel was valued at $150,000 with cargo at the time of the loss. PHOENIX (1993) The 104 foot steel fishing vessel Phoenix drifted onto the rocks and was lost April 12, 1993 between Twin Lava Point and Derby Point off of Umnak Island. 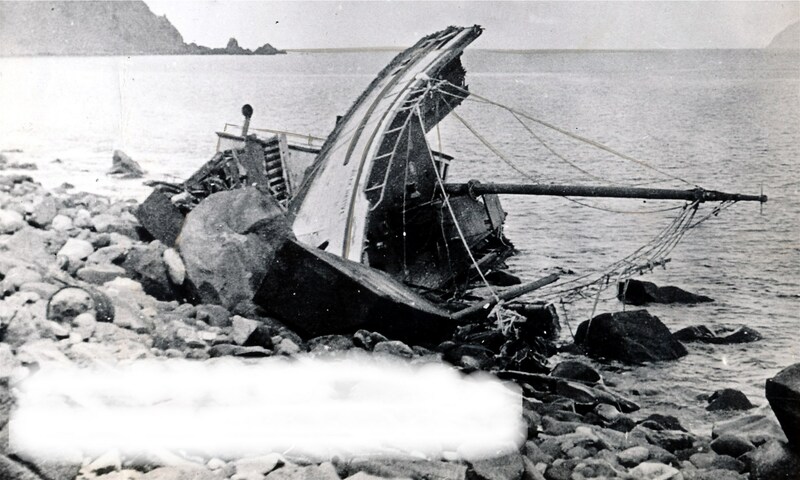 Problems with the main engine reduction gear clutch coupled with the vessel’s rigging entangled in her rudder and a dragging anchor allowed the Phoenix to drift onto the rocks. Pounding seas soon destroyed the vessel. There was no loss of life. POLAR COMMAND (1989) The 122 foot steel diesel powered fishing vessel Polar Command stranded and was lost October 15, 1989 at the east end of South Cove on Chuginadak Island in the Aleutians. The entire crew of 26 was rescued. PREDATOR (2017) The 90 foot steel trawler Predator grounded on the southern shoreline of Akutan Harbor just after midnight February 13, 2017 when a crewman fell asleep at the helm. The Predator was returning from the fishing grounds north of Unimak Pass and had 330,000 pounds of fish aboard. After several hours of strong wind and wave action, the vessel developed cracks in her hull and flooded becoming a total constructive loss. A U S Coast Guard H-60 helicopter lifted the three crewmen to safety. After multiple attempts to refloat the vessel, Magone Marine of Dutch Harbor finally was able to dewater and haul the Predator to their salvage yard. PREDPIIATIE SV ALEXANDRY (1802) The Russian vessel Predpiiatie Sv Alexandry (Enterprise of St Alexander) wrecked and became a total loss at Unalaska Island in 1802. PT-22 (1943) The Navy PT boat PT-22 was beached and abandoned in a storm June 11, 1943 near Adak. PT-219 (1943) The 78 foot Navy motor torpedo boat PT-219 foundered and sank during a storm September 14, 1943 at Casco Cove, Attu Island. PUTCO-2 (1959) The 90 ton 70 foot steel barge Putco-2 stranded and was lost September 8, 1959 near Dutch Harbor.